Stress! Tension! Anxiety! Apprehensions! Fears! Can we count atleast ten people who live oblivious of the obvious? Have you ever wondered how exactly do we live in peace, unmindful of the pressures around us? The answers which we have read many times come in handy at the time of exams even if we hadn’t revised it the previous night. This is because many neuronal circuits are brought into play every time we read – The basis of Remembering! There are certain things which forget – how? 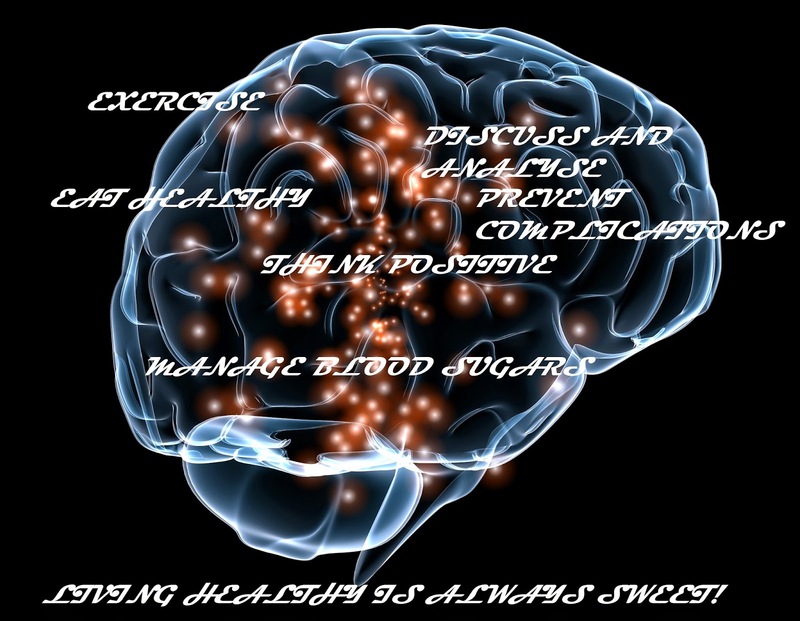 We tend to ignore a few things and over period of time our Brain ignores these details!! How is this relevant in any way to us? To this blog..... Diabetes?? The common misconception is that Diabetes stops with blood sugar being high, so it is enough to keep checking Fasting and Post prandial sugars alone! In fact Diabetes is a Multisystem disorder (Not a Disease per se). It can literally affect any part of our body. Take time for your health! Manage Diabetes better! Human mind is filled with desires. It may be related to profession, personal life or purely to enjoy a cosy life! Professional desires help us set targets for ourselves and angle us towards achieving great heights. Personal desires and wish buckets help us challenge ourselves to a better living! Without desires life will be Monotonous & Boring. From time immemorial it has been a neat business trick to capitulate on human desires for better profits! Well, as we all know Diabetes is spreading far and wide. India has become the Capital of Diabetes. Chennai is slowly moving towards having 40% of its people affected by Diabetes. Now why actually are people scared of Diabetes? Have to go for walking! Intermittent and excessive snacking has to be controlled! Do you think people are scared of these things? The answer is a pure NO!! Now in the era of internet dominating our lives diet restrictions and exercise are slowly becoming more common even in a non-diabetic population. People follow these may be for pure weight loss or to prevent Diabetes or just to stay Healthy! If these are not bothering people why is everybody scared of Diabetes? Numbness or tingling in feet........ Are my nerves affected? Will I lose my limb? Will I be bedridden? Lesser urine or passing yellowish urine....... what about my kidneys? Sugar is eating up the kidneys? Dialysis? Kidney transplant? Slight discomfort in chest ...... Diabetics can have silent heart attacks. Am I having one right now? These may sound funny or over exaggeration for some of you. No.... these thoughts do linger in every person with Diabetes! Have regular checkups so that problems may be identified and corrected in the very early stages. Here comes the business! The profit! Advances in technology have helped find alternatives for every Doctor’s advice. Some have worked and some are yet to reach the masses. Believe me or not! Some company has started advertisements of non-alcoholic whiskey! Smoking! This is something which the patient lies every time to the Doctor! It is the pure addiction which makes the person lie for years....The Desire! So how do these basically work? They look like the real thing. The end glows as you inhale. As you exhale, you puff out a cloud of what looks like smoke. It's vapour! All e-cigarettes work basically the same way. Inside, there's a battery, a heating element, and a cartridge that holds nicotine and other liquids and flavours. Features and costs vary. Some are disposable. Others have a rechargeable battery and refillable cartridges. Using an e-cigarette is called "vaping." NO! Nicotine inside the E-cigarette is addictive. You can get withdrawal symptoms including feeling irritable, depressed, restless and anxious. What we advised all these years? Not a smoker - Don't start vaping. There are no health benefits and some risks. Decided to Quit smoking - Better off with an FDA-approved method of quitting, like the nicotine patch or gum. 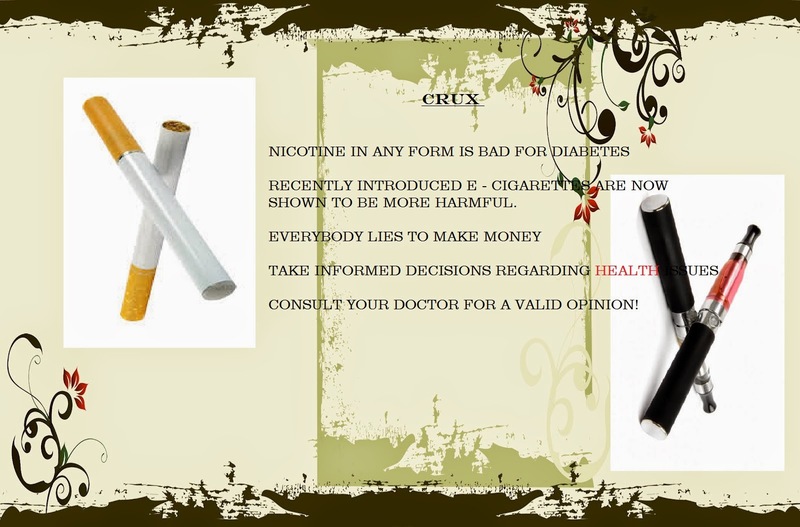 Not decided about quitting - would it be healthier to switch from tobacco products to e-cigarettes? Maybe! Talk to your doctor about the risks and benefits. E-cigarettes contain up to 10 times the amount of cancer-causing agents as regular tobacco. Researchers found carcinogens such as formaldehyde and acetaldehyde in vapour produced by several types of e-cigarette liquid. Formaldehyde- a substance found in building materials and embalming fluids- was present at levels 10 times those found in the smoke from regular cigarettes. Your health lies in your hands! Make an informed decision! Here in Chennai it was a wonderful weather with Monsoon setting in making Chennai a “cool” place. The latest member of the family is Glimipride- 3rd Generation Sulphonylurea (AMARYL, GP, GLIMESTAR*). This molecule claims to have a cardioprotective effect and is supposed to give a smoother control of blood sugars. To put it in very very simple words these drugs bind to receptor on the cell membrane of pancreatic beta cells (insulin producing cells) this binding results in a series of chemical reactions and finally increases the intracellular calcium level in the Beta cell leading to release of insulin. So basically speaking these drugs do not increase insulin production. They only help to bring out the already produced insulin. How to take these drugs? For some unknown reasons the timing of these drugs are not given due importance. The mode of action which I have explained here is an over simplified version. It contains more intricate steps which needs time. In order to obtain the full benefit of the drug and to get a proper sugar control Sulphonylureas have to be taken 30minutes before food. This family currently comprises of 4 members and all of them come as plain tablets or in combination with metformin or as a megamix of sulphonylurea + metformin + pioglitazone. Personally i do not prefer using triple drug combinations as dose adjustments becomes more confusing plus the chances of appearance of unwanted side effects are more when such multiple combinations are used. Sulphonylureas are real pillars for effective management of Diabetes. Used as per recommendations they serve you well. When dosing sulphonylureas the chances of hypoglycaemia have to be kept in mind. Never try to double the dose of half the dose without expert help. I think i have covered the most important drugs used in Diabetes. My next post would be on Newer drugs used in Diabetes..
*- Trade names are used only for the sake of familiarity. Author does not intend to support any of these brands using this blogpost..
Hope you all have enjoyed reading my previous posts on “DIABETES - WHAT YOU NEED TO KNOW”.. In the last post I had mentioned about Metformin. 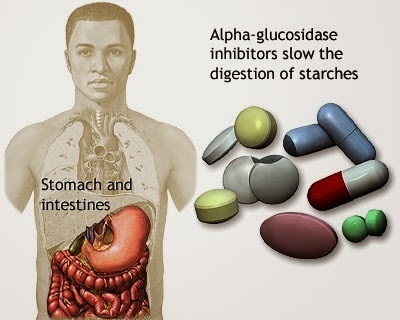 Today we will be dealing with another class of drugs called ALPHA GLUCOSIDASE INHIBITORS. Names like GLUCOBAY**, ACARB**, MIGNAR**, ELITOX**, VOBOSE**, VOLIX**, PPG** may sound more familiar.... Right? These drugs belong to the class of drugs which help in controlling the post prandial blood sugar values. Three major groups are currently available in the market. In the late 90’s the group ACARBOSE (Glucobay**, Acarb**) was introduced in India. By 2006 VOGLIBOSE (Vobose**, Volix**, Ppg**) was introduced into the market. The main purpose of these groups of drugs was aimed at controlling the post prandial spikes in Diabetics. To have a better understanding of this we need to know how the normal body works. Generally speaking the fasting blood sugar level is based on what you eat and also on the amount of glucose being pumped out from the liver. The post prandial values are largely based on what you eat. In normal people the pancreas release insulin in spurts in response to the food you take. So the pizza, burger, chocolates, ice creams or sweets are processed well and blood sugars are maintained in the normal range. As a patient develops Diabetes this normalcy is altered. The first pathology noticed is the altered timing of release of insulin from the pancreas. 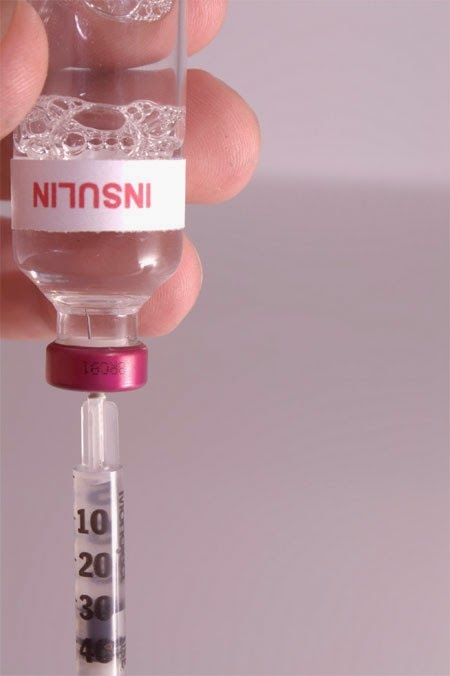 There is a delay in release of insulin so what happens is that the insulin is released a little later than expected. As there is nobody to regulate the incoming sugars the blood sugar levels slowly start to creep in the post prandial state. During management of Diabetes we face this challenge with majority of patients in India. There is an unexplained peak of blood sugars in the post prandial stage. Here is where this group of drugs help us. Basically what we eat comes in the form of complex carbohydrates. For effective absorption these complex carbohydrates have to be converted to simple carbohydrates. This function is carried out by an enzyme in the body called Alpha Glucosidase. This alpha glucosidase enzyme is inhibited by these groups of drugs. The result is that the complex carbohydrates cannot be converted to simple carbohydrates and hence cannot be taken up by our system. How to take alpha glucosidase inhibitors? The duration of action of these tablets is very short compared any other tablets used in Diabetes management. The general recommendation is to take the tablet just before food or take one morsel of food, take the tablet and continue with the food.. These tablets are available in plain and as combination with metformin. Although the mechanism of action seems very convincing it normally doesn’t prevent the complete absorption of carbohydrates from the food we take. These drugs are generally used as “second line” drugs in management of diabetes. Acarbose & miglitol are available in 25mg and 50mg packing. Voglibose comes in 0.2 and 0.3mg forms. Some patients can have altered Liver Function Test with this drug so it is necessary to check your LFT once in 6months or atleast once a year. The class of Alpha Glucosidase inhibitors are a very good option in controlling post prandial blood sugars. They have no effect on the Fasting blood sugars. It is safe to start on a lower dose. Hypoglycemia with is tablet is very rarely. The side effects in the form of gastrointestinal or Hepatitis are to be taken seriously. Doctor is the best judge to decide the dosage and timing of these tablets. Wishing all my readers a very happy and safe Diwali!! *This write up is intended only to present scientific facts in the simplest way possible. There is no intention of contradicting your doctor’s treatment or opinion. **Trade names are used only to make the reader understand the drugs better. The writer does not intend to support any particular brand via this blog. 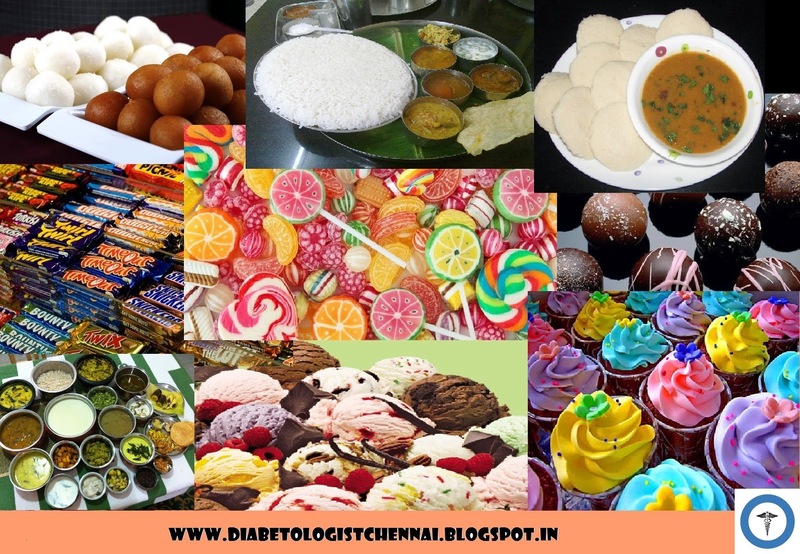 So continuing with the series of Diabetes – What You Need to Know!! Today I am going to talk about Oral medicines. When we think of Diabetes the name which comes along with Diabetes is the wonder drug called METFORMIN. Metformin has been a cornerstone in Diabetes Management for decades now. A small group of old time physicians are still apprehensive of using this drug. The reason is not Metformin but its predecessor PHENFORMIN. This phenformin which was used during our grandpa’s time had its own side effects. This drug was withdrawn from the market long back. Metformin is devoid of most of the unwanted and dangerous side effects. Metformin comes under the class of BIGUANIDES. Apart from its major role in the treatment of Diabetes Metformin is used in Conditions like Polycystic ovarian syndrome, weight management and where ever there is a need to combat insulin resistance Metformin is the drug of choice. Recent studies also indicate that this drug is useful in Breast Cancer. There are some studies which talk about the benefits of metformin in Rheumatiod Arthritis as well. Well to understand this you need to know the very basic principle of Diabetes. Diabetes is a result of two processes. First one is the reduced insulin production by the pancreas and secondly the Insulin resistance. This means already the pancreas is producing little insulin and the body is not ready to take up the insulin in a normal way. Now this doesn’t happen overnight... It takes years before you actually develop Diabetes. This stage where the body is trying to help you by overworking is called PREDIABETES. This is the only stage where the pathological process of progression from Normal to Diabetes can be STOPPED! ( I will write about Prediabetes in a later post ) When the body doesn’t utilize insulin in the normal way the Pancreas tries to compensate by producing much more insulin than required. This phase goes on for a few years. Slowly the pancreas also gets tired and Beta cells (Insulin producing cells in the Pancreas) start failing. Only when a considerable amount of Beta cells fail Diabetes develops. Metformin acts at the level of insulin resistance. The cells of our body act like locks and insulin acts like a key. Insulin opens up the receptors (the lock in the cells of our body) so that GLUCOSE can get inside the cells for a normal function and extra glucose can be converted to glycogen which is the storage form of glucose. In Diabetes, the number of receptors readily accepting insulin are less. With addition of metformin glucose uptake is better thereby reducing the level of glucose in blood. A combination of Metformin & Acarbose. Combination of Metformin , Sulphonylurea & Pioglitazone. When you are prescribed a plain tablet it is better to be taken after food. If you have been asked to take a combination generally the 2nd member in the combination is important to decide the timing of tablet. This holds true for combination of Metformin and sulphonylureas. So whenever you visit your Diabetologist or Physician never forget to ask in detail regarding timing of tablets. Metformin comes in various strengths. In India its is available as 250mg, 500mg, 500mg SR, 850mg , 1gm and 1gm SR. Although the number looks big compared to other tablets used in the treatment of Diabetes it is relatively a mild tablet. As it acts peripherally in reducing Insulin Resistance it can be used as the sole drug in treatment of diabetes or as an adjuvant to Sulphonylureas or Insulin. This drug should not be used when the Kidney function tests are abnormal..
DIABETES - WHAT YOU NEED TO KNOW!! Hope you all are having a sweet life..! Today I am going to talk about some simple points which every Diabetic and care givers need to know. Diabetes as you all know is one topic which is widely spoken, discussed, researched and everyone tends to have their own views on Do’s and Dont’s. This happens among Physicians and Diabetologists as well. One doctor says “You can” and the other doctor says “It is bad”. So how to decide what to do?? Well the answer to this dilemma remains in you choosing your Doctor. The normal pattern of Doctor Selection in India depends on where the Uncle, Aunty or Neighbour is consulting. If they say Dr.X is good then we start believing that and go ahead blindly with what he/she says. Worse scenario is when you go to pharmacy and ask the pharmacist who is the nearest good Doctor. Pharmacist doesn’t exactly know what you are having. End result is that we see is that there are so many patients whose diabetes is managed by surgeons or gynaecologists. We do face this situation where the patient ends up with the Diabetologist only when the treating doctor says “You Need INSULIN”. By this time you have already wasted much valuable time experimenting on different types of medicines and your pancreas is too tired to take up any more experimentation/trial of tablets. 1.Select a Doctor whose is ready to spend time during your first visit. 2. See if he is asking you regarding details of your diet, exercise, regularity of medication & Timing of medication. These are the points which help a Diabetologist select the best regimen for you. your progress by how you are feeling after starting the new medicines. Always report any kind of discomfort to your new Doctor. 4. Of Course .... Needless to say that you should never lie or hide some details from your doctor. The most common explanation given are “Oh ! That was done a long time back... Is it important” or “ I dint feel good with the earlier medicine, SO we will forget all old things and start treatment fresh” or “ We lost it all when we shifted from the old house, let’s start fresh”...... The fact remains that you Doctor knows best what is important and what is not so let him decide. Please don’t take decisions on your Doctor’s behalf. Secondly you and I can forget everything and start fresh but your body DOESNT follow the policy of FORGET & FORGIVE! It remembers all the trials, insults and experimentations done on it so instead of getting better you may feel WORSE.. 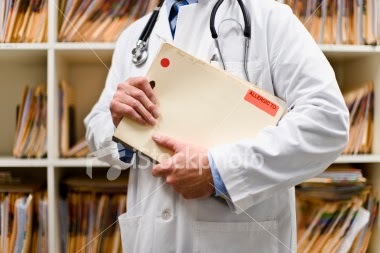 Finally your old health records are not just papers... They hold so much of valuable information on what your body has gone through. They help the Doctor understand your body better and avoid unwanted drugs or drugs which may have some adverse effects on you..
5. Take all your old reports and prescriptions with you during your first visit. Make sure the Doctor goes through these during your first visit before prescribing medicine. If the Doctor is least interested to go through your old reports then you need to Think twice..
6. Never ask us “Doctor , Can ayurveda or Siddha Cure Diabetes? 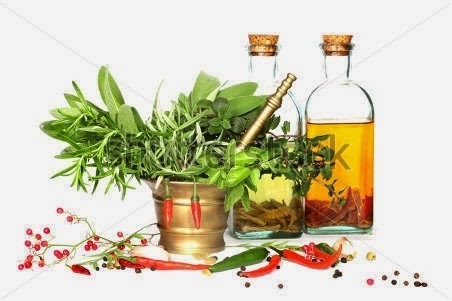 Can I try?” It is not that we don’t like traditional medicine, the fact is we don’t know how it works. It is a undeniable fact that we do see lots of screw ups and lots of major organ damages so to be frank we would not like to comment on it. Before you log out of my blog I must tell you that this post is not intended to criticise my colleagues or to form a generalised opinion. This is a result of experiences I have personally faced over the past 5 years as Diabetologist and 10years as a Doctor (There are worse ones which I feel should not be publicised in a public forum). Secondly I intend to cover some topics like timing of medicines- why follow them, Adverse effects of common medicines used in Diabetes etc. So please feel free to come back.. Finally before i say Bye I would be happy to see your comments and/or Constructive criticism..